Jesus called His disciples to be servants. Period. However, contrary to the Lord’s command, so-called “church leaders” have given themselves fancy titles like Reverend, Monsignor, Pope, and Pastor. Reverend comes from the word Revere, meaning Worship; Monsignor is from the Italian word Monsignore, meaning My Lord; Pope is from the Greek word Pappas, meaning Father; and finally Pastor comes from the Latin Pastor, meaning Shepherd. Pride and arrogance could not be any clearer. Our Lord Jesus never called anyone to be a “leader.” As a matter of fact, there are no titles in the church, only duties. We are all simply brothers and sisters in the faith. See Understanding the DUTIES of Ministry for an exposé. The leader of the church assembly is Christ alone, working through His Holy Spirit. There’s not one directive in the bible that ascribes leadership positions within the Body of Christ. Each one of us has a particular gift. No one gift of service is superior to the others, and no one gift places one Christian above the rest, because the head of every man is Christ. See Understanding the DUTIES of Ministry for an exposé. Where on earth do these so-called “leaders” get the idea that they are leaders and not servants? Why would they even call themselves so? 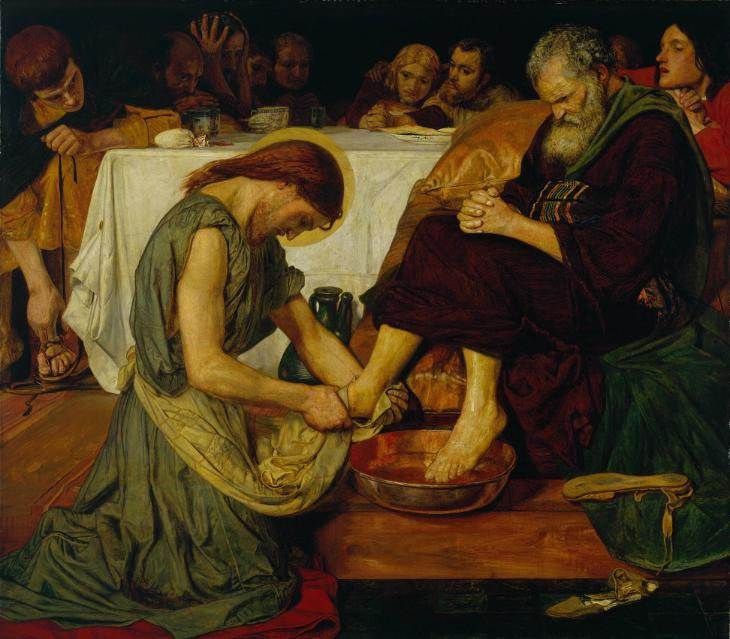 If the King of Kings and the Creator of the Universe can “stoop so low” – forgive the bad expression, just making a point – as to wash the disciples’ feet (John 13: 1-17), why do so many church “leaders” think that their most important job is to hide behind a pulpit and talk and talk? Or tweet and tweet? Or write books and books? Or parade and parade themselves on TV? And the list of these vanities goes on and on. Jesus never talked much. The longest He ever did was in the Beatitudes. He mostly accomplished things. And all the things He accomplished had to do with touching the lives of individuals, often one by one. So, dear “leaders,” where are your Jesus-like fruits? Or in the immortal words of the so sweet and tangy grandma of the old Wendy’s commercial: Where is the beef? Throughout the years, these “leaders” have talked so much that some of them ended up introducing, through evil and perverted speech, many false dogmas that we at Biblicism Institute feel compelled to rectify. Perusing this site will give you an idea as to why we, simple servants/volunteers, do what we do here. There’s a reason why these so-called “leaders” don’t want to be servants, though sometimes they pay lip service to being so. A servant can’t live the high life – unless of course he works hard for it in a non-ministry capacity, and without exploiting his fellow Christians like a parasite living off its host. For instance, not only does the Pope live a life of luxury, but when he travels he requires an additional boatload of money: private airplane, security guards, red carpets, hobnobbing with powerful politicians, etc. See Is the Pope Peter’s Successor? Jesus had no abode on earth He could call home, and every time some rich individual would approach him, this was the gist of what He usually said. When will the Pope sell everything the catholic church owns and give it all to the poor? Further, this is how Jesus dealt with politicians: He told them the truth about their character. When will a Pope or a Preacher call the POTUS a fox or a rascal or a murderer? And what’s with all the security apparatus at the Vatican or when the Pope travels? Why is the Pope so afraid of being assassinated when Jesus and all the Apostles were killed doing their job? But, see, it’s not just the Pope. Most protestant preachers live the high life as well, while many in the flock go through hardship. Watch video below. They lie about the tithe and ministry money, and continually perform the unbiblical liturgy they call Church Service. It’s time for Church Reform. The “concrete” church is the biggest scam created for power and money…It is in my opinion the main reason why there is so much confusion and division with Christians…In my view the Church is either a private or social club for Christians and if you don”t tithe the pastors look at you as a non-christian.Nobody should be making a living off the Gospel, it should be free. Free it should be, indeed. Thank you for your invaluable insights into God’s Word !!!!!!! Tears of joy my precious precious brothers and sisters in Christ. Nothing but tears of JOY for your presence. What an AWESOME answer to prayer you are. I am simply overwhelmed with JOY because of YOU. Thank you so much!!! Words cannot express the true JOY you bring me. The courage, the love and the biblical and historical accuracy and honesty that you are providing is changing the world… RIGHT NOW in the most profound ways you could imagine. I have been in 5 churches for the last 40 plus years, with a lot of time off, and I have never learned so much as I have from your website. I have read many of your articles and they accurately discuss many issues, most of which I have never heard discussed from any church leader, for obvious reasons.